One by one, Western scholars and policymakers who once hoped that China would transform itself in the West’s image have come forward in recent months to say they now believe themselves to have been wrong. Now the debate is whether China’s authoritarian revival will help the country supplant the West or hasten the Communist Party’s demise. 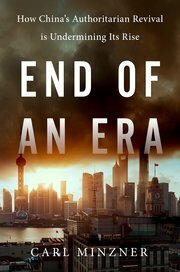 In his new book, Carl Minzner argues why he believes a China that is unwilling to accommodate loyal reformers, let alone alternative sources of social legitimacy and power, is increasing the risk of extremism and the likelihood of an unstable transition to whatever comes next for the country. Minzner, a professor at Fordham Law School, examines two decades of aborted reforms to the country’s economy, politics, and religious and ideological landscape, before comparing China with formerly authoritarian Taiwan and South Korea, and, less conventionally, late-nineteenth century Russia. A final chapter devoted to “possible futures” illustrates what bad, worse, and worst outcomes for the country would look like. While informed by “nearly two decades of conversations” with Chinese in and out of the system, the book draws largely on secondary reporting and analysis. One of the chief challenges of this book is its temporal framing. Minzner seems unwilling to commit to whether counter-reform began with the Tiananmen protests – and before many of the most dramatic changes to China’s economy and society occurred – or more recently with Xi’s rise. Before and between those milestones, China has embarked on any number of liberalizing reforms, from village elections to greater judicial independence to a bigger role for civil society. All have fallen short of the promise they held. Sometimes this was because of a failure to execute and at others because of active counter-reform, a distinction that Minzner could have made more clear. Nonetheless, the stop-start nature of China’s reform efforts reveal an important truth: powerful antibodies within the Party repeatedly kill off any reform with real potential. It is too bad that this book does not do more to help readers understand the dynamics of how ambitious reforms are able to be launched in the first place and the counter-reform that stops them. In particular, one wishes that Minzner had devoted more attention to how new technologies, once heralded unquestioningly as a liberating force, have proven themselves capable of giving authoritarian regimes greater power than they had just years before. Until recently, China was renowned for its system’s tolerance of local experimentation from which the best ideas were scaled nationally. Under Xi, power has become much more centralized while lower-level officials have become more reticent to take productive risks. A highly diverse and unequal society cannot be governed from Zhongnanhai alone. Unwilling to significantly defer even to local authorities for fear that they may become rival power centers, the system resorts to rule by command and punishment instead of trusting in the extraordinary potential of the Chinese people. Xi is constraining the country’s capacity not just to seize new opportunities, but to respond to future crises. As an example, consider the United States in the fall of 2008, when the country was navigating the worst financial crisis since the Great Depression, its wars in Afghanistan and Iraq, and a presidential election. Each of these alone would be enough to test the stability of many of the world’s governments, but the US’ stability was not at all questioned. That moment exemplifies the idea of “bandwidth,” an analogy familiar to bureaucrats to describe the capacity of an individual or institution to manage multiple simultaneous priorities. Its system already stressed as it is to maintain day-to-day control, it is hard to imagine that China could simultaneously navigate a financial shock, a militarized conflict, and leadership transition. Aware of the severe constraints on China’s institutional bandwidth, when a crisis happens, the many rivals to Beijing within and beyond the country’s borders will almost certainly be expected to exploit it to press their advantage, confident that the country’s leaders will be too distracted to respond. Events could very suddenly become unmanageable. Minzner is particularly attuned to the risks of popular extremism. Unable to organize under even semi-sanctioned institutions that can act as a moderating influence, decentralized networks radicalized by their sense of persecution emerge instead. When due process is denied, frustrated citizens can and have found themselves capable of violence, whether against themselves, the state, or other members of society. Minzner invokes China’s history of millenarian religious uprisings when discussing the country’s ongoing spiritual revival and pays special attention to Falun Gong, which, after experiencing a severe crackdown, has reconstituted itself globally in opposition to Beijing. While there are plenty of reasons to agree with Minzner’s bleak outlook, there is nonetheless reason for a contrary optimism: the Chinese people. Even as the atmosphere has become less freewheeling in recent years, Chinese live freer and more prosperous lives than any time in their history, an important source of stability. Few of the tens of thousands of protests that China experiences each year are motivated by extreme ideological concerns. Even if some of their tactics are excessive, protesters are fundamentally motivated by a belief that they are entitled to basic rights and due process. Even with a ban on the discussion of Western liberal ideas in China’s universities and media, its people are increasingly internationally conscious, with many having experienced first-hand the promise and real limits of a free society. A popular revolution seems nowhere near as likely as elite-led upheaval from within the system. While there is no credible organized opposition to the Communist Party, that does not mean that the country lacks individuals who possess the respect and ability to lead it in a new direction should that time come. China’s people want the same things that all people aspire to. One can foresee doom for the Party without forgoing hope for the country. As the Communist Party turns inward, the need for Western engagement, especially that focused directly on China’s people, only grows.